A cup of hot, homemade soup is like pulling a cozy sweater around your shoulders on a chilly day. It is, invariably, a sign that cooler weather has come and that colder days are worth persevering. I looked up quotes about soup and found one that said “women just have a primeval instinct to make soup”. I don’t know if this is universally true, but it’s definitely the case at our house. I have a few standard soups that are becoming fast favorites, but here’s the one we’ve consumed the most this fall. Of course, the goal with cooking is to make the best food with the most nutritional value, so I find myself tweaking recipes and adjusting things until we are satisfied with the contents. This one is great because it has the comfort of potatoes and a little cheese, but it is broth-based and is loaded with “surprise” veggies like carrots and celery that promote health without stealing the show from the potatoes and broccoli. Keep in mind that, of all things, soup is an art, not a science, and you can radically adjust the ingredients to your taste and still come up with a fantastic meal! add 2 cups of chopped CELERY when the onions are translucent. add 8-10 medium peeled-and-chunked POTATOES and 3 peeled-and-sliced CARROTS (or better yet, carrot shreds from the prepared salad aisle! 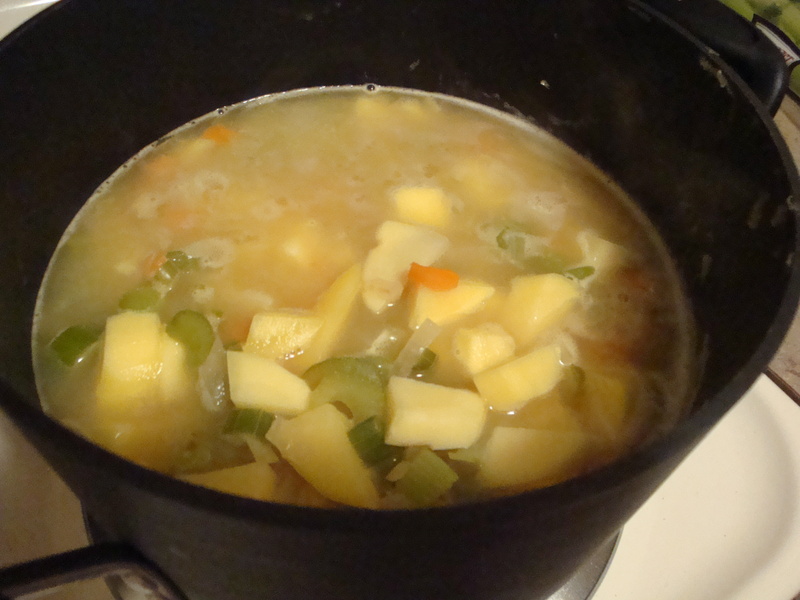 ), and fill the pot with CHICKEN BROTH, boiling until the potatoes are soft. Use an immersion blender (or a potato masher if you don’t have one) to blend all the ingredients, adding more water or chicken stock as needed for consistency. add 1 bag shredded SHARP CHEDDAR, 1 bag (or 2-3 heads) chopped BROCCOLI and around 1/2 pound of diced HAM. season with pepper and watch for the broccoli to turn bright green before enjoying with a salad and crusty bread!